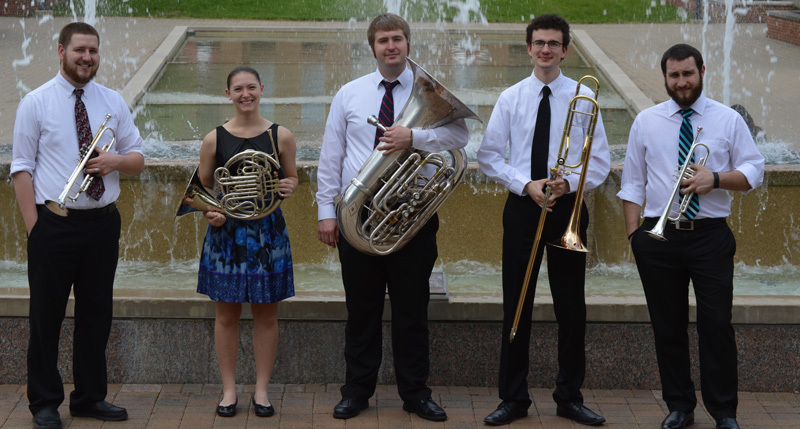 During the 2014-15 academic year the Department of Music partnered with concert:nova, Cincinnati's renowned chamber ensemble, to provide an intensive professional internship opportunity for five Miami brass students. Miami trumpet professor Douglas Lindsay, Associate Principal Trumpet of the Cincinnati Symphony Orchestra and a member of concert:nova, coordinated the program. Coaching sessions provided opportunities for students to meet professional musicians from the area. Ellen Karnes, Marketing Director for Seek, and board member for concert nova gave instruction in marketing and branding while Jason Podplesky, actor, director and adjunct instructor at Wright State University taught students the basics in improvisational audience interaction. Margaret Dyer, Grammy nominated and nationally recognized chamber musician provided coaching in preparing for an interactive performance, conceiving new ways to interact and connect with audiences. The internship culminated in a concert with the concert:nova brass quintet at St. Mary’s Church in Cincinnati. concert:nova was formed in 2007, blending the traditional and contemporary with a visual twist to explore a modern, kinetic and powerful concert experience. They are comprised of professional musicians from the Cincinnati Symphony Orchestra and the surrounding area. Three of these musicians, Carson McTeer, Steven Pride, and Douglas Lindsay, are adjunct faculty members at Miami University.